Backlink Checker: Monitor Your Backlinks for improved SEO! 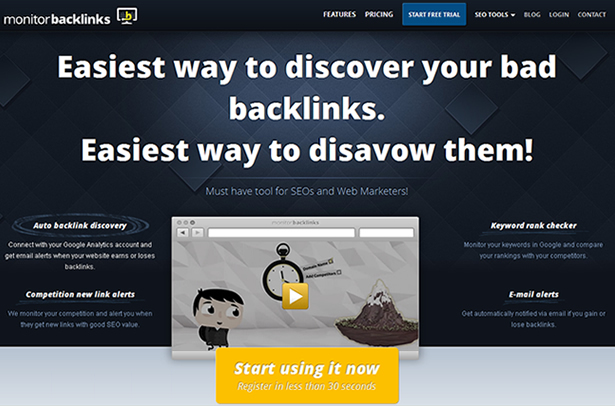 →Backlink Checker: Monitor Your Backlinks for improved SEO! In today’s difficult SEO, one of the the seo tools you need is a reliable backlink checker. What this will do is keep an eye on your backlinks and send you an alert whenever there is a change. This is one of the best ways to avoid the next Google penalty distributions. MonitorBacnklings.com is a tool I have been using for the past couple of months and because of its results, I have decided to talk about it in this review post. This seo online tool has a couple of facilities but in this post, I will be dwelling more on its backlink checker and monitor. 3 ways this Backlink Checker and Monitor is useful! It checks every day for new links pointing to your website and lets you know as soon as that happens. An e-mail will be sent to you with a link to that article so you can thank the blogger or ask for feedback from his readers. You know how much efforts you put in creating valuable links pointing to your site. Some of these links you got through expensive guest blogging activities. What if one of these sites you link from removes your valuable link after just a short period of time? Monitor Backlinks will let you know almost instantly! Do you want to keep an eye on your competitors’ link activities? They are constantly spending valuable time and resources to find new websites that will link to them. This backlink checker will monitor their activitis and send you an e-mail every time they get new backlinks. 3 steps to get started with MonitorBacklinks. Step 1 : Go to this link and create a free trial account. This will take you to your dashboard. Step #3: If you choose to sync your dashboard with Google Analytics (recommended), you will be prompted to add in your competition. NB: Once you add your links or domains to the tool, it could take up to 24 hours before you see results. What do you get on a typical report? Link status – nofollow or dofollow. The page where you get the link. The page that the page points to (on your blog). PR of the domain where the link is located. The country and IP where the site is hosted. Free backlink checker: this helps you get an overview of any website backlinks. Redirect checker: See if your page redirect and where it redirects too. This will also tell you if it’s good for SEO or not. Unique domains: If you use Google Webmaster Tools and export your backlinks or other 3rd party tools like Ahrefs, Majestic SEO or Moz, you may need to just get the total number of unique domains or a list of only 1 link / domain.This is where this tool comes in handy. Just upload the list of URLs and you will get the total list of domains, list of 1 link / domain or even remove duplicates. That’s it! Now, you are able to know the backlinks changes that affect your blog on daily basis. Just go grab the free 30 day trail to discover the tool in greater details. I’d also like to hear from you if you are using this tool already. Leave your feedback in comment box. I am using Monitor backlinks to monitor my competitors backlinks and to track my keywords positions since 10-12 days and the results are great !! The good thing is that whenever there is a change in the keywords position or backlinks they shoot me a mail ! However Hrefs is the best tool as their index get updated after every 15 minutes but it is not easy for everyone to afford it. So its good to start with monitor backlinks . Even I am also using Monitorbacklinks.com it is best backlink monitoring tool. The best thing about is that it provide each and every update directly to Inbox. Enstine Muki recently posted… WebMeUp replacements – Other online SEO tools for better ranking! today started to use monitor backlinks better and easier than other costlier sites thank you. It is sure of give it try. I will use it. Backlinks are the most important crucial part of the SEO that become target of Google. One wrong move and you are gone. This tool seems to be great Sir. This will surely make checking and monitoring backlink work easy for us. Really a great tool make easier to find the bad sites who linking our sites and make them disavow. There are many features which a Blogger want. Just signed up for the 30 days trial. It’s a great idea that you introduced this tool here – it will sure simplify things. I remember how a simple tool I once used reported all broken links (and their exact locations) to me. This really made my work easier. This is one tool I honestly believe I need to check out. This is one great product! A few months ago, I had to fix my broken links. This was a total nightmare. It took me and my husband (we took turns) the entire weekend to fix my blog. Lesson learned…my Google ranking dropped because of this too. Now I have to be climbing back up again. I did install a plugin, but not as good as this one, so I think I’ll go over and check this out. Okay, this is really a great service I have to admit. I might have to take it for a test drive to see what they share with me. I’m use to the broken link checker program but am curious to see how this one is different. Thanks for letting us know Enstine and another great find. The best way to measure its effectiveness is to take the test drive. Within 30 days, you will put together enough data to draw conclusions. I had not heard of MonitorBacklinks.com before. Up until now, I’ve been using BrokenLinkCheck.com. A lot of people recommend the Broken Checker Plugin but I prefer to not add a plugin for this functionality.) Since this is a service rather than a plugin, I’ll keep it in mind for the future. thanks for sharing the discount too. It’s worth checkin this out. What a great moment to read your comment here! Yes, some readers have already taken advantage of the code. I think it’s a good gift for anyone that wants this beautiful service. I’m on this page since last one hour and half. I’ve created an account on MonitorBacnklings.com and this is a new tool to me. This is really an amazing tool for search engine optimizers and their other services are greater than other monitoring tools. Thank you in advance dear for sharing this informative article. Yes dear, absolutely that tool helps me a lot and I’ve used that coupon code 😉 Thanks again. I use hrefs and their data is a little boosting one. All the tools available online works differently and thus there is a huge confusion for which tool to rely upon. It was nice of you to review the product and explain us the benefits. The fact that it will tall instantly if one loses backlink is the eye catching feature. Also that it tracks new links everyday, is an interesting. Thanks for sharing this detailed report.This is a very helpful post for all newbies.i will definitely follow this backlink checker for my site. Nice Review. Monitor Backlinks is a best and essential tool for every bloggers. I used that plugin recently and it works well for me and it shows new backlinks and lose backlinks and Google keyword rank up and down perfectly. But, Yesterday i found a new WordPress SEO plugin named WPFullSEO and it seems to be useful than Monitor backlinks. It have many advanced SEO features and it shows the google keyword rank in our WP Dashboard. Really it is an all in one solution for all our WordPress SEO needs. I wrote an in-depth review of WPFullSEO on my blog today morning. Have a look and convey your views about it. Back-links are back bone of all websites,we should monitor that links regularly for that “Monitor Backlinks” is really great source. Thanks a lot for sharing this awesome and very useful information with us….